There are many apps that went through my download lists over the years, but none that have drawn my full attention so far. When it comes to astronomy apps available around for Android, iOS and Windows, there’s a huge variety in the app stores (I’ve mentioned a few in the past). As matter of fact I’ve had many thoughts on building my very own to use out in the field in order to help find my favorite objects, guide my telescope, create log book entries, search in databases, etc. But nevertheless there has never been enough time to build something worth keeping a long time. Before you know it you either loose your phone, get a new one and loose whatever these apps have stored locally in their internal databases on the phone. One day as I was browsing my emails doing my weekly clean up, I came across an email with subject “SWISS Made Cosmic Watch For Astronomy in 3D”. In the beginning I thought it was one of these ads I receive letting me know of what cool gadgets I can buy. Ads that normally find me through diverted AI search bots checking at my age, my interests, location and places I’ve visited on internet. Interestingly though, Google didn’t toss that particular e-mail in my spam folder and so I opened it up. The very first sentence made me understand it wasn’t one of the regular salesmen or spam bots that greeted me, but instead a person who was impressed by my blog. I kept reading and he asked me to evaluate his app. For starters I didn’t expect much until he gave me a redeem code to download his app for free. The download finished just before I had to leave for work and I didn’t have much time to look at it before it was lunch time. Needless to say my jaw almost dropped once I switched it on. In all honesty I never seen such advanced graphics and such an awesome implementation of a mobile device app before. And mind you, I’ve worked as a software engineer for almost 20 years now. 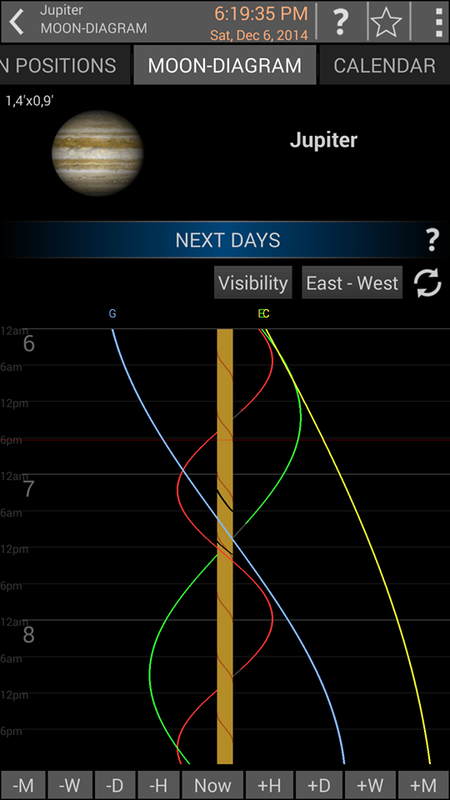 Among the many features available, the ones I got mostly impressed about were the ability to see the planet positions over time both in the future but also in the past. 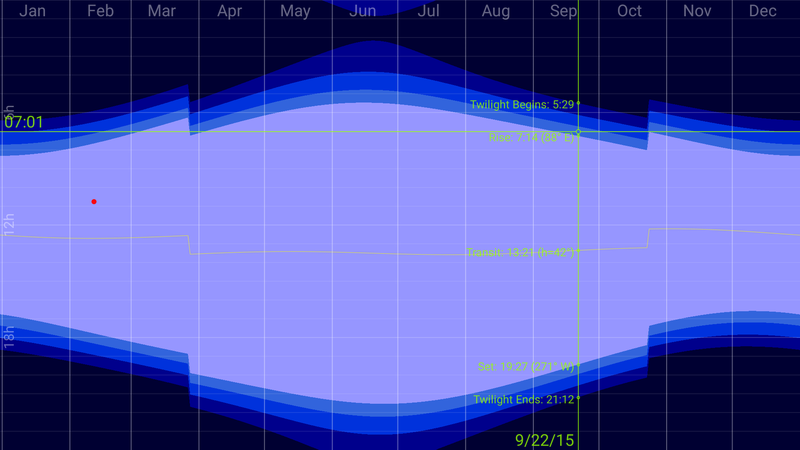 You could look at the planet position on the day of your birth, or other historical events down to the seconds level. 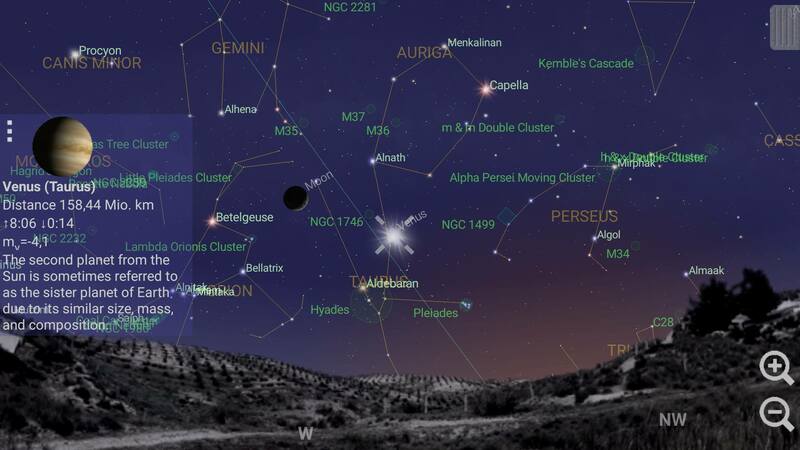 The modes available can display the position of constellations in night sky at certain point of time or real time in the day, make you zoom into features on earth’s surface and add favorites to re-visit something. Well done Cosmic Watch and big thanks for letting astronomy fans access such great work! Cosmic Watch is developed by Celestial Dynamics Ltd. This entry was posted in Android, Astrophotography, Evaluation, News and tagged Android, App, Astronomy, Celestial Dynamics Ltd, Cosmic Watch, iOS, Mobile Device, Samsung, Swiss. 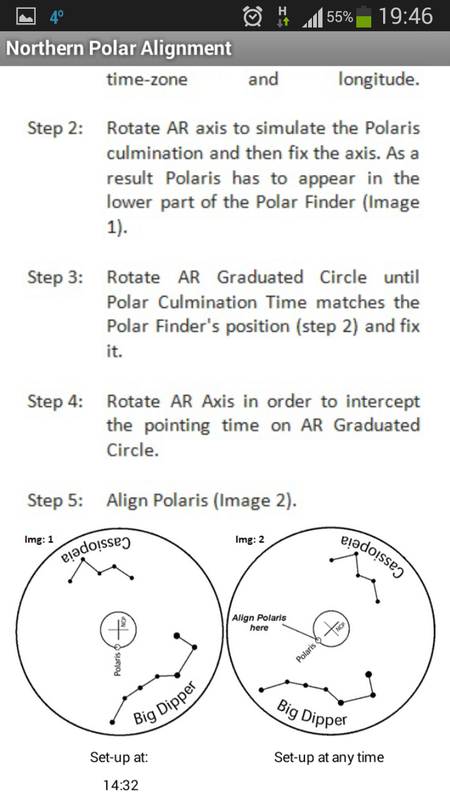 By owning an equatorial mount, you’ll find yourself in the situation to perform a polar alignment to your mount each time you assemble your equipment prior an observation. 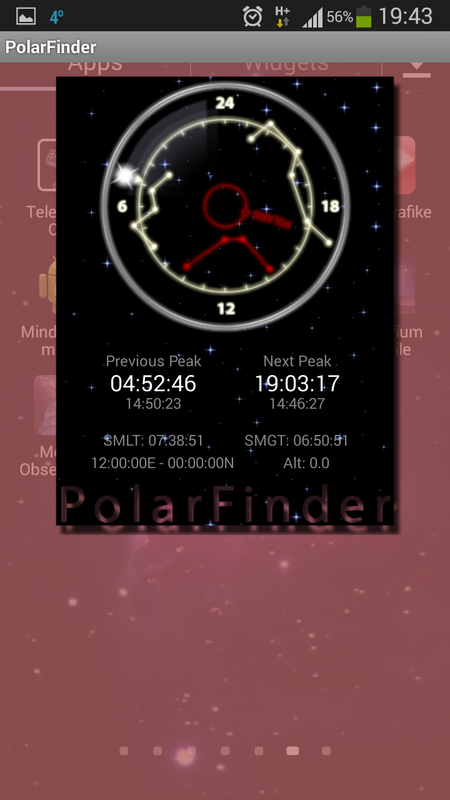 However, apart from using the setting circles and calculating the polar star position manually, there are a few phone apps worth mentioning that would save you a great deal of time. Before phones and tablets entered our lives amateur astronomers relied on printed paper sheets including an approximate to the polar position reticle sky chart that resembles the finder scope reticle chart in your mount. 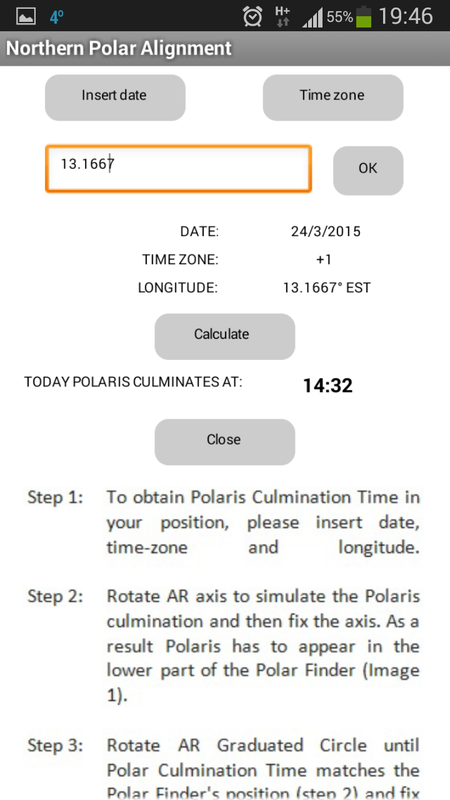 Today’s phone apps are able to locate your exact position through the phone’s built-in GPS ability including the exact time and thus calculate more accurately than before the current polar star position allowing you to do a finer alignment to your scope mount. This app was the very first one that appeared at Play Store but I never succeeded making the reticle image cover up the entire screen as shown in the screenshot. 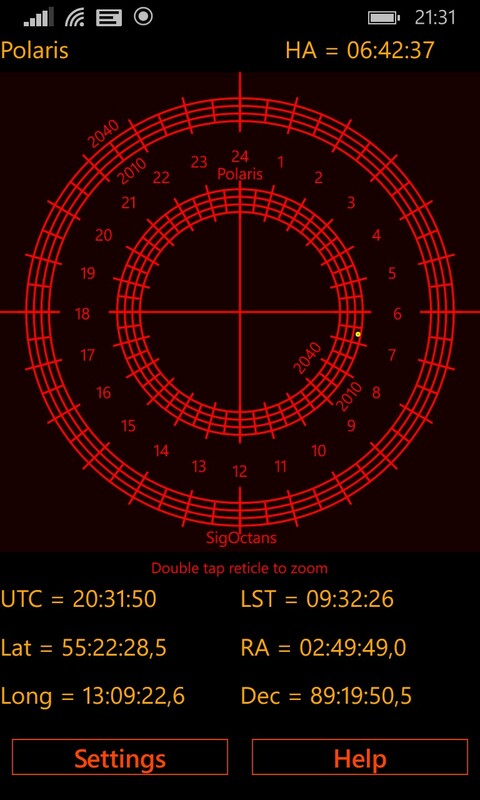 Also its not very obvious in the reticle as where the polar star should be located at. 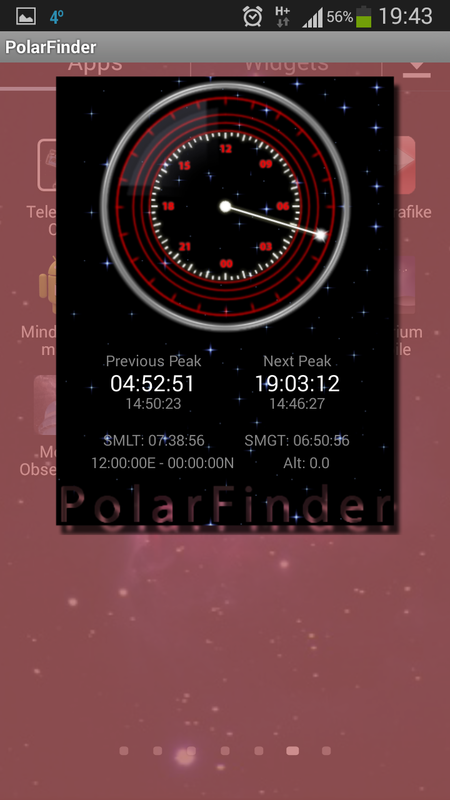 This is a much simpler version of polar finder that supports only the northern hemisphere. You have to set date and time zone manually as well as your longitude every time you enter the app. It has some static text with information on the screen and it doesn’t look overly impressive by any means. It wouldn’t be my first choice or recommendation to anyone in comparison to what is available out in the app stores. 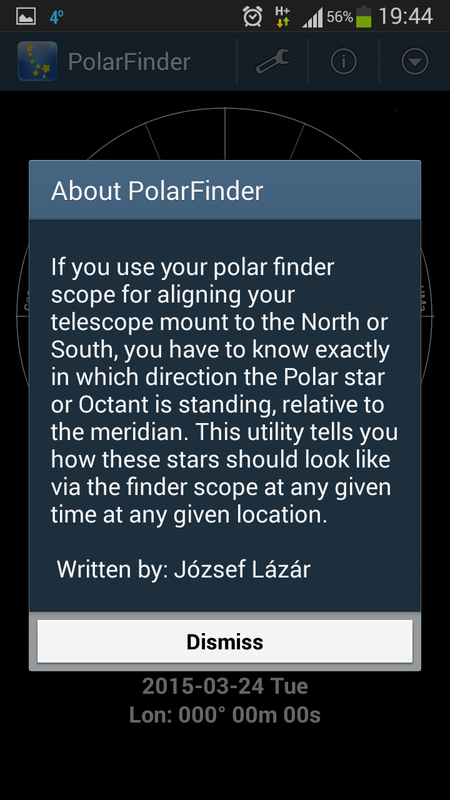 The next app is called PolarFinder developed by Jótzef Lázár and is in my opinion the best choice so far. It uses GPS just as the previous app but has many more options to choose from than any of the previous apps so far. The best function is that you can change reticle types to ressemble the reticles in the most known mount types. These are Ioptron, Astro-Physics, Losmandy, Skywatcher, Takahashi, Vixen, AstroTrac and StarAdventurer. 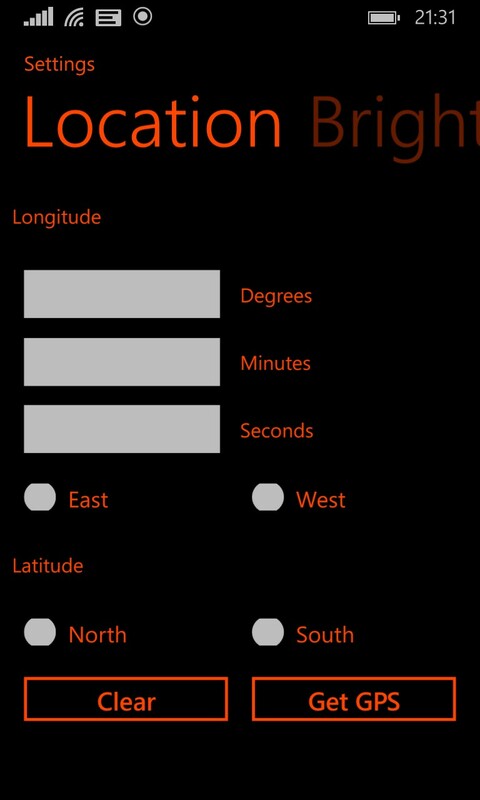 The longitude can either be entered manually, or acquired through the phone GPS. 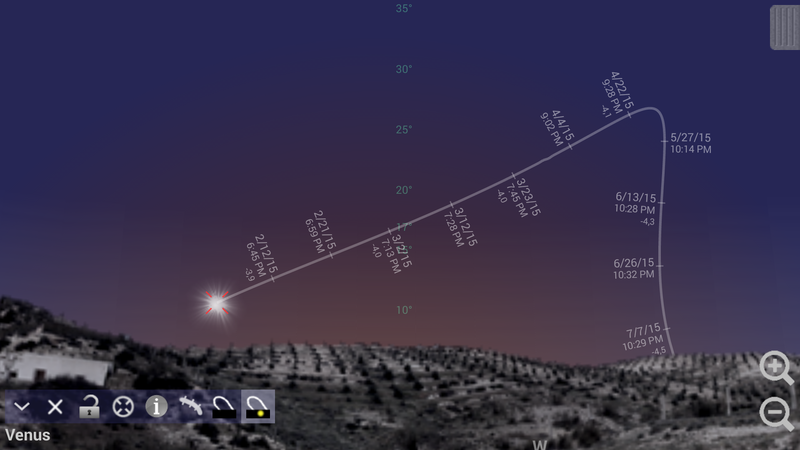 You can adjust the markers distance, night mode, date format, star sizes and hemisphere location (north/south). The image orientation option is greyed out when you choose among telescope types and enabled when you use the “Built-in” reticle type. 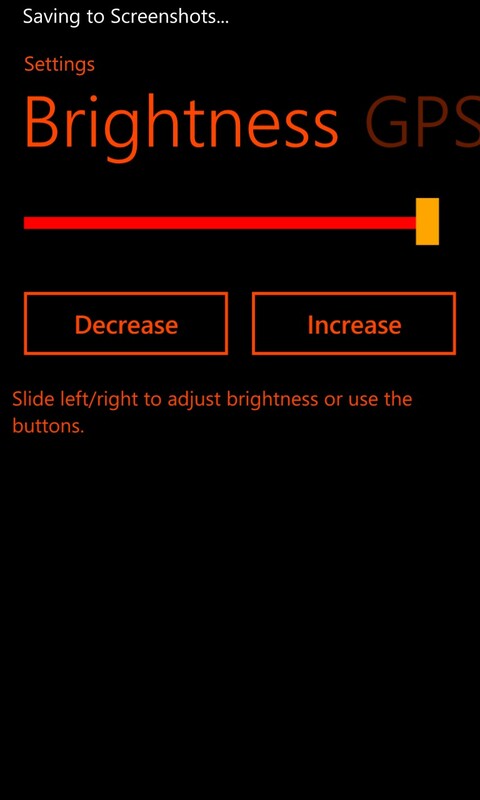 For the windows phones and tablets out there you’ll find this neat app that by default in night vision mode. 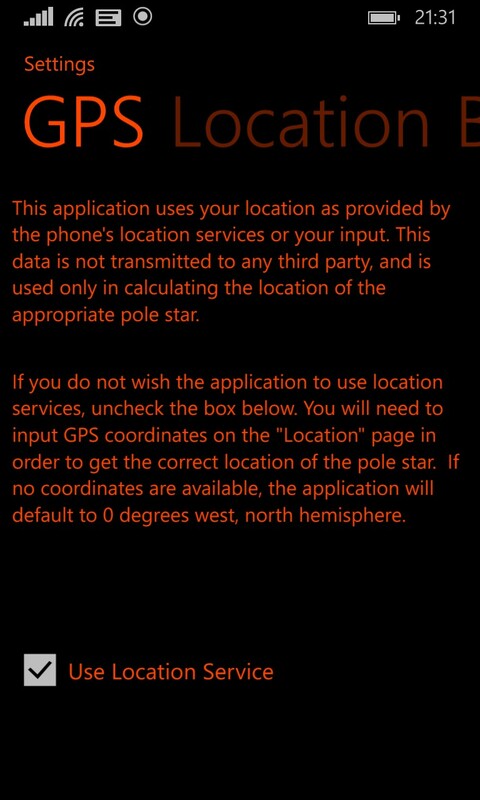 You can choose to either allow the phone enter your GPS location or enter it manually. The night vision brightness is adjustable through a slider and the reticle is very easy to understand. A double tap on the reticle image zooms in for more detail. I would say this app is neat and has a very clean layout. Finally, this app is found for free in the Windows Store. 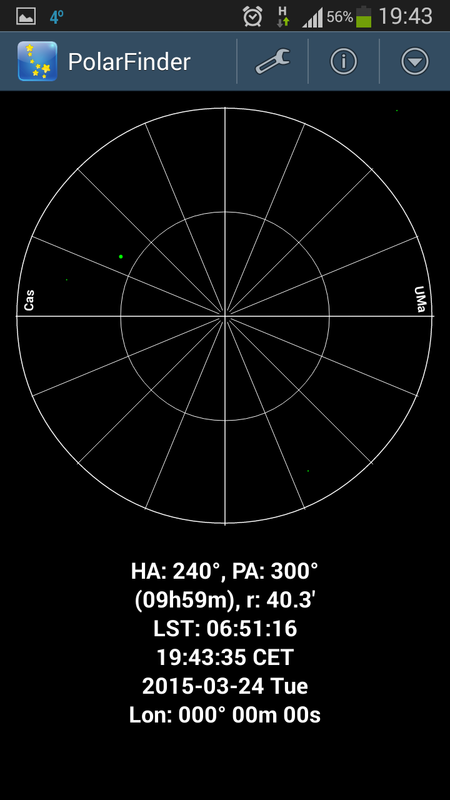 This entry was posted in Evaluation, Reviews and tagged Android, App, App Store, Astro-Physics, Linux, Losmandy, Mobile, Mobile Device, Niklas Henricson, Northern Polar Alignment, Polar, Polar Alignment, Polar Finder, PolarFinder, Skywatcher, StarAdventurer, Tablet, Takahashi, Vixen, Windows. I’ve been using for quite some time a few apps that I would love to mention. This time I’m promoting something called Mobile Observatory; its current version is 2.6 and has been developed by Wolfgang Zigma. I’m very restrictive when it comes to IT- or other tech-suggestions before I’ve tried things out for quite a while, but this phone app is very neat! For 1½ years now it sends me regularly updates only when I’m entering the app. Also, it doesn’t force you to update anything if you just want to go ahead and start using it, even though you really want to if you’d like to keep yourself with up to date astronomical events and data. So my suggestion is to go ahead and download all databases in advance before heading out to observe the night sky. I must say that I really dislike uncalled updates on my phone specially when they are forced upon you by Play Store; but the creator of this app is restraining the uploads quite well! I think I’ve updated the app itself only twice during these two years of using it. I am attaching two links on the bottom of my blog post so you can visit and read all the features in detail, but I’ll mention just a few nifty ones that I find very cool. Eclipses – All about eclipses!!! The app has of course many more features. You can search deep sky and planetary objects, the app will bring you all the information you need in regards to your location, point out the visible objects for you and give you detailed information on what you’re looking at. You can add objects in your favorites list, you can also browse back and forth in time for an object and also get suggestions on what are the best visible objects for a particular date plus allows you to add calendar reminders when it comes to events. 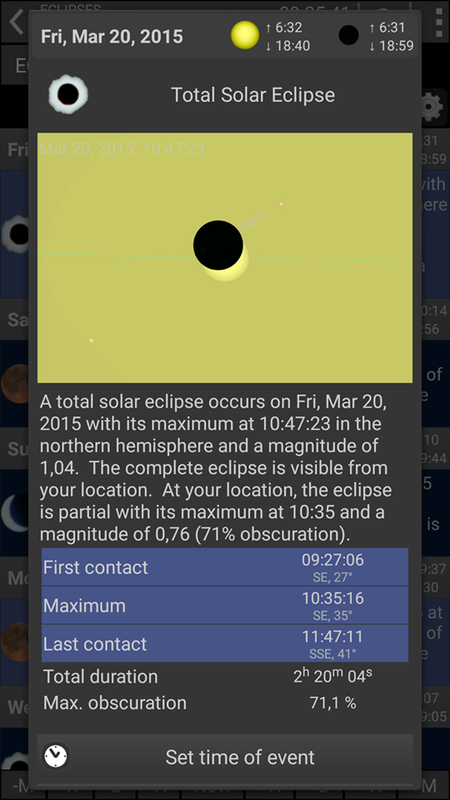 No need to purchase astronomical calendars or booklets anymore, this app really has it all you need and more for an amateur astronomer. But wait.. Did I mention it also has a night mode view in red light. How cool isn’t that?! This entry was posted in Android, Evaluation, Reviews and tagged Android, App, Database, Niklas Henricson, Observation Planning, Planets, Star Chart, Twilight.